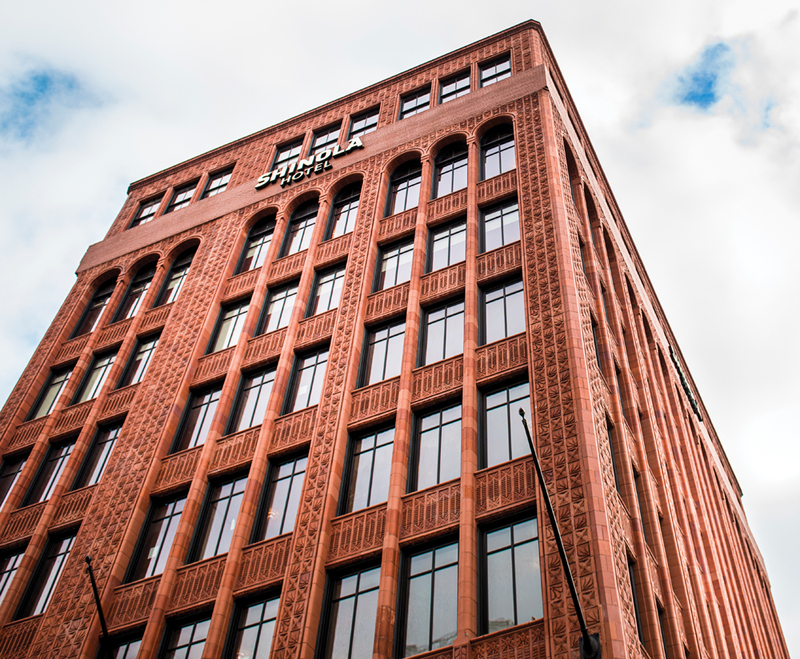 The soon-to-be-open Shinola Hotel, on Woodward Avenue and East Grand River Avenue, broke ground in January 2017. 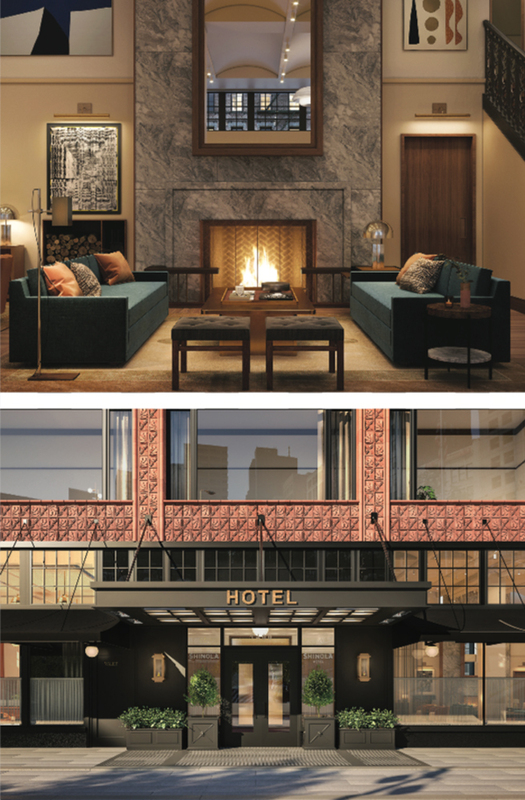 It’s early fall and the Shinola Hotel is quickly approaching its highly anticipated mid-December opening. 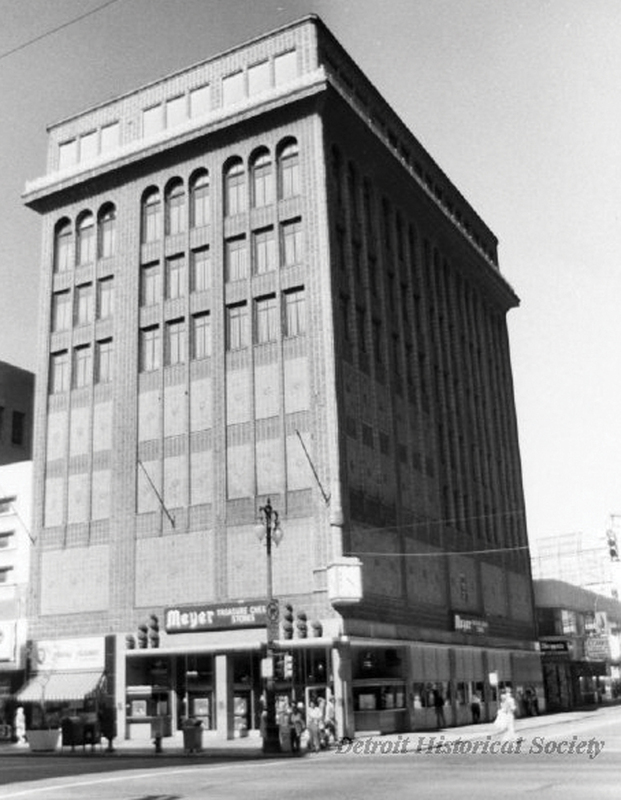 And while the four buildings that make up the watch and leather goods brand’s 130-room, eight-floor hospitality venture in downtown Detroit are still relatively bare, elements of their personalities are becoming evident. Bright sunlight shines through a dramatic, slanted window in what will soon be a suite, a staircase hints at the grand entrance that will eventually welcome visitors into a large community space, and a long strip of marble wallpaper can be seen through a doorway as workers tend to the massive project. 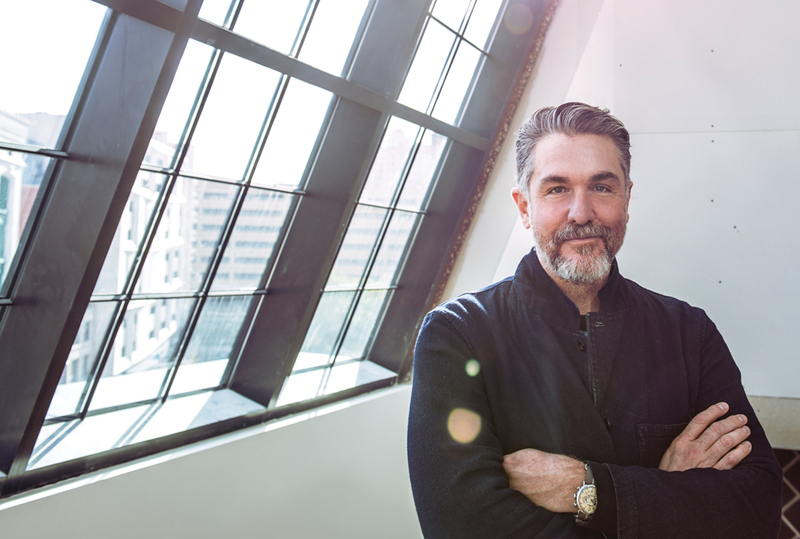 Daniel Caudill, creative director of Shinola, stands in a hotel suite. 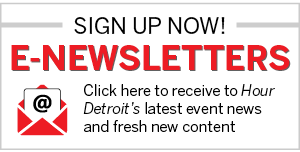 The brand’s hotel concept follows the trend of lifestyle brands venturing into the hospitality industry — West Elm, Restoration Hardware, and Equinox (expected to open in New York by 2019) all reportedly have hotel projects in the works — but once complete, the Shinola Hotel will be unlike any other lodging option in Detroit. Guests will be able to wake up to the sound of a Shinola alarm clock. They can plug their phone charger into a Shinola power strip, and make their way down to the lobby to rent a Shinola bike. If they’d like, they can even listen to music from a Shionla turntable. Guests can then purchase all of these items from the brand’s newly constructed Shinola Hotel store. 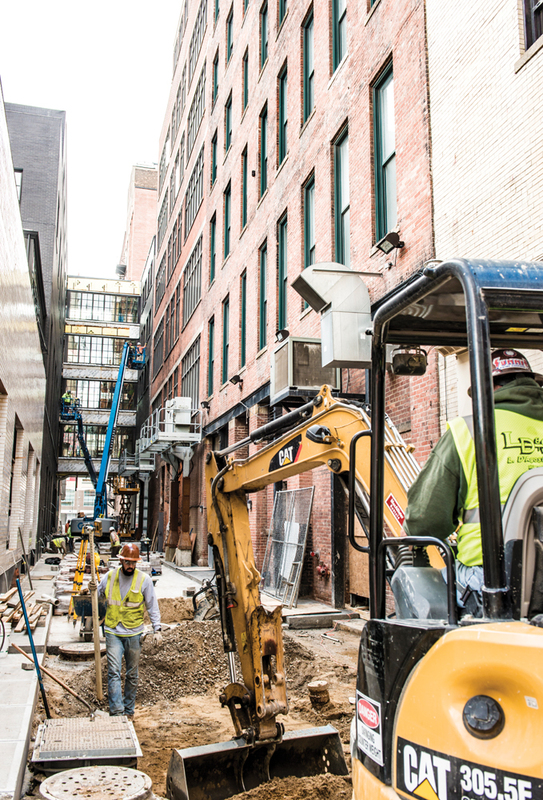 Construction in an alley at the Shinola Hotel in October. When complete, the space will feature shops, eateries, and a beer garden. 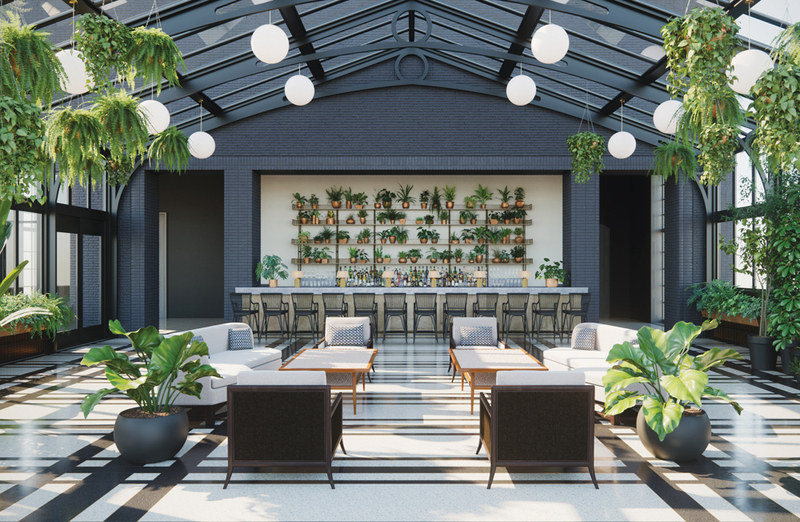 An extension of Shinola’s modern American approach to design, the hotel hopes to operate as a “living room for Detroit.” Occupying 16,000 square feet along Woodward Avenue, its inviting interior will be accentuated by high-quality leather, wood, and custom-designed furniture. “We tested different levels of stuffing in the cushions,” Caudill says. “There was so much thought behind every single thing.” This attention to detail extended to retail partners, which were intentionally curated to offer national and local brands like Madewell, Le Labo, Drought, and Good Neighbor; and food and beverage options operated by NoHo Hospitality. Honoring the integrity of the historic buildings that make up the hotel was also emphasized.